So I have a different kind of sowing for you today, with the good weather this morning I spent some time up the greenhouse to sow some seeds. There's nothing better than getting your hands stuck into fresh compost. These are the last ones i'll be sowing under cover, everything else will be direct sown later in the month. This is my second year of 'growing my own' and i've tried to scale things back a little this year. Last year I grew as many different vegetables as I could possible fit in my little 'allotment' space in my back garden, but this meant that my time was too stretched to keep up with and harvest everything before things spoiled. A common rookie mistake I believe! So less is more this year. I have already sown a few seeds earlier in March which I shall show you in my greenhouse tour blogpost coming up soon. Today I sowed some Runner Beans, Peas and French Beans. Also a yellow variety of Courgette. A classic red flowering variety. Runner Beans are my favourite crop to grow, because I remember sowing them in the garden with my Grandad as a child. They are so easy to grow and are prolific croppers as long as you pick them regularly. They also freeze brilliantly without having to blanch them first, many a night I spend sitting in front of the tv slicing up runner beans into freezer bags. You can put them straight into boiling water from frozen for a delicious summer vegetable all year round. These are a petit pois variety of pea that I chose because they're a bush variety and don't need any support. Last year I grew climbing peas that got very unruly and messy which got on my nerves A LOT! Haha! So i'm trying to keep them neater this year with a nice row of bush plants. I have sown 24 seeds here and will fill up the rest of the row with seeds directly sown, depending on space. I only want one row as i'm not sure how successful these will be, a bit of trial and error this year. A yellow variety of french bean, chosen again because they don't require any support. These are bush plants that produce heavy crops of long yellow beans. I've sown 18 seeds here to have one row of them in my legume bed. They need to be 4-6 inches apart so, if I have any space left over i'll direct sow some seeds for cropping later in the year. I have linked where I bought the seeds from, if you click on their names it should take to the websites. I got all my seeds online this year from Sarah Raven or Premier Seeds Direct on Ebay. I've heard really good things about PSD on various Facebook groups so decided to try them out this year. Their prices are really reasonable for a good amount of seeds. Should my beans and peas be successful this year, i'll buy all my seeds from them next year, their variety to choose from is huge. Above you can see i've sown 3 Courgette seeds, these are the Soleil F1 variety from Sarah Raven, quite expensive at £2.50 for 8 seeds. So I hope they're successful. I had a lot of Courgettes last year, but those were a green variety I got free with a magazine, so these have a lot to live up to. I grow them in a large half barrel type of container. I love Courgettes so I'm hoping these are heavy croppers. I also feed courgettes to my chickens, they love them too! I was very lucky when I bought my house to inherit all my Grandad's tools and gardening equipment. So I didn't have to start from scratch buying everything I needed. The greenhouse also came with the house when I bought it, although it needed a lot of work getting it ready to grow anything in it. But I still had to buy quite a lot last year... building raised beds on the lawn, buying plants, pots and seeds trays, canes, plant food, lots and lots of compost, etc. So some things I wanted had to wait, one of those things was this Brother garden label maker. A treat for myself to bring in the new growing season. I saw Rob promote this on Twitter last year and decided I had to have it, it's perfect. The labels are fade-proof, waterproof, super sticky and look pretty swanky in my greenhouse, haha! You literally type in your plant name, print, peel of the back and stick it to your plastic plant labels - awesome. So there you have it, a little garden update for you all. I hope you find it helpful or at least interesting. If you're growing your own this year, please feel free to give me any tips or tell me where i'm going wrong. This is my own little adventure and I don't know anybody who grows vegetables like me in real life. It's all books and youtube for me. I'll leave the blogpost here with a couple picture of my greenhouse helper. Last Saturday I went my favourite kind of shopping with my friend Rachel, we went into town to hit up the Birmingham markets for fabric. The fabrics here are such a good price, if you're local to the area and want lots of material for not a lot of money, this is your best bet. They may not be the best quality but they're pretty decent and especially great for beginners. If, like me, you make a dress too small (i'll leave that there, that's for an upcoming post) you didn't waste too much money buying the fabric. My favourite stall is in the indoor rag market and has every kind of material you need but especially the cotton section, tons of different designs and patterns for £2 a metre. Perfect for most of the patterns in my collection so far. So these are the fabrics for my quilt, they are 100% cotton, 45" wide and all £2 per metre. This was such a good deal because I needed 9m in total, as this is my first attempt at a quilt, I didn't want to pay £8-12 per metre for the quilting fabrics I see online. Not until I know what i'm doing! Haha! The floral is a navy background with pink and red roses, this is my theme fabric and also the backing fabric. I used this fabric to match and contrast the other fabrics for the quilt. This one I got from the outside market, next to all the fruit and vegetable stalls. It's a cream background with a tulip pattern and is the most gorgeous, soft fabric. I think it must be some kind of cotton blend. Its 60" wide, £2 per metre and I have 3m here. This is for my second attempt at the ESP dress. I've got another dress on the go at the minute, but the ESP No.2 is next. You know when YOU KNOW you bought something but have absolutely no idea where it is, you've even looked for it many times and you start to doubt yourself that you did, in fact, buy it? That. 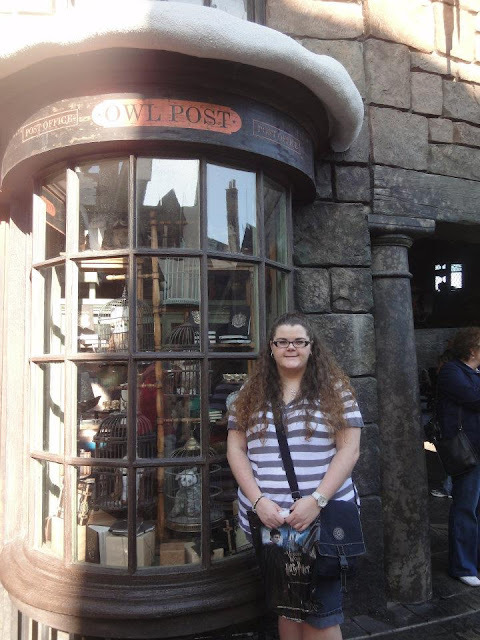 I went to Orlando in 2012, specifically to go to Harry Potter world at Universal Studios. I never even set foot in a Disney park, I went purely for Harry Potter. I bought some souvenirs, obviously, that literally vanished as when I got home. I've been looking for them for 4 years!!!! Today, I found them. I finally found them. I've been working hard lately to open every box that I haven't unpacked yet, even though i've been in my house for over a year. Today I decided to tackle the box marked 'Makeup', you know I have way too much makeup anyway so this box was never an urgent one for me. But low and behold, I open the box and sitting on top of the lipsticks, the powders, the brushes was one The Wizarding World of Harry Potter carrier bag. I screamed with joy! So heres a mini haul of what I got. Being the stationary addict that I am, I got some parchment paper and a Hogwarts wax seal, a notecard set and a Pygmy Puff, who needed a name. Being the Slytherin that I am, she's been christened Pansy. Heres a little throw back to 2012 and the Post Office. Now I just need someone to send a letter to. Tonight i've had a go at knocking myself up a few coasters in a bid to keep my white desk clean and well, white! I used this blogpost from www.prettyhandygirl.com as a pattern and got sewing. This is a really easy project for beginners like me and very inexpensive, you can generally find some leftover scraps of material to use. I used the same material we (my Mom and I) made my sewing room curtains out of. I'll include some basic instructions here but head over to Pretty Handy Girl's post for the full in-depth tutorial. First of all you will need to gather some materials together; you need enough fabric to make two 5.5" squares for each coaster you want to make, a 5" square of wadding (used for quilting - this is optional but will make a thicker, more substantial coaster. I got mine off Ebay for a couple of pounds a metre), a few pins and thread. Once you've got all your notions handy, it's time to get cutting. For each coaster you need to cut a top and a bottom square of fabric measuring 5.5" x 5.5" and a square of wadding measuring 5" x 5". Next, you will need to sandwich your top and bottom squares with the right sides of the fabric together, and the wadding on top. This is now ready for sewing, you need to sew up 3 sides and then halfway along the 4th side, leaving a small gap. You can the trim away the excess fabric to neaten up you sides, as i've done below. Now it's time to turn your coaster inside out, using the small gap we left earlier. This gap will now be sewn together, using your hands tuck the open fabric inside to neaten your edge and put a pin in it to keep it in place for when you come to sewing it on your sewing machine. It's now ready for you to sew all the way round the 4 sides to complete your coaster. And there you have it, a pretty coaster, handmade with love. I don't know about you, but I really think something you put time and effort into making for yourself means so much more than anything you buy in a shop. I've certainly realised this now. As you can see I made a set of five, as that's how much leftover fabric I had to work with. I'm thinking of making a set to match my living room cushions now, as I have spare material from when I made the cushion covers. There's also the added bonus of being able to chuck them in the washing machine. I hope you enjoy making some for yourself, please tweet me pictures if you do! I have honestly lost count of the number of times I have restarted this blog, I always do it with the best of intentions and then life gets in the way. Looking back upon it now, i'm such a different person to the girl I was when I first started writing blogposts. It's sat here unloved now for quite a while now, over two years in fact, and not because I didn't have anything to say, I just didn't have the time to devote to it. However, since I bought my new house back in November 2014 i've had great plans for this little blog but it took me a year and a half to finally sit down and get cracking. Buying this house was a huge change for me, it's a 3 bedroom bungalow with a loft conversion, a big garden and a long list of diy that needs doing. 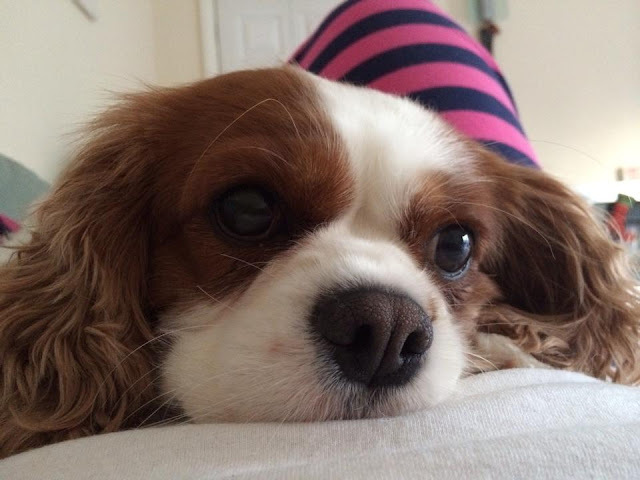 Along with the house came Holly, a 5 year old King Charles Cavalier Spaniel that has become my whole world. So my time has been taken up with this whole new lifestyle change, a bigger house comes with more responsibilities both financially and physically. What I used to spend on makeup is now spent on grass seed and paint and new furniture and a never ending list of things that i'm still getting round to and will be for the foreseeable future. Now though, I have finally finished refurbishing my spare room into a sewing/blogging/craft room. Its like an adult playroom that I can't stop looking at, its just so perfect and has turned out just the way I wanted it to. A post will be coming up soon with all more details and pictures but for now lets just say I have a desk, with a shiny new computer where I can now finally sit down, uninterrupted and talk to you. My hobbies now are an eclectic mix of dog walking, sewing and knitting, scrapbooking, gardening and grow your own, baking, country music, holidays and reading which I hope to share with you all here as well as a few other random things thrown in here and there. Whatever tickles my fancy, if you will. So if you're new here, welcome and if you're still here from before, thank you so much for sticking with me. If you are given ruled paper, write the other way.